Pimps of Joytime If you have yet to encounter the Brooklyn-based band, The Pimps of Joytime, prepare to take a funky ride! The PJTâ€™s live events and recordings have captivated fans all across the country, as they have begun writing their own success story, show-by-show, and track-by-track. Bandleader Brian J is a charismatic and soulful visionary, whose well-crafted songs invite the listener to enter a world of infectious dance grooves and indelible melodies. Spending formative years in New York City, New Orleans and Los Angeles, Mista J honed his craft, becoming an accomplished live performer, multi-instrumentalist and producer. In 2005, Brian began to assemble a group of righteously soulful vocalists and musicians to assist in bringing to life the musical concept that would become The Pimps of Joytime. The bandâ€™s diverse sound and spirited attitude is strongly influenced by the Brooklyn DJ culture and live music scene from which they emerge. Recent collaborations with legendary artists Cyril and Art Neville of the Neville Brothers and Roy Ayers have helped vitalize the bandâ€™s connection to its roots. Over the course of the past five years, The Pimps have evolved into a road tested and audience approved groove machine. They have excited crowds at over 100 club dates and festivals in 2012 alone, and are on target to exceed that volume in 2013. 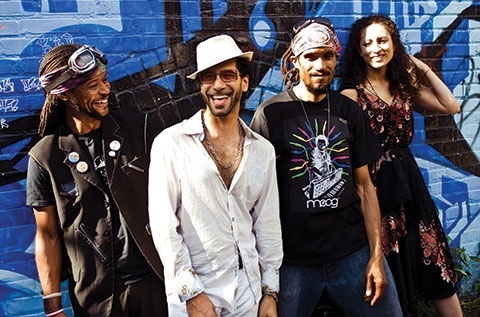 The exponential growth of the bandâ€™s fan base can be partially attributed to an artful blend of musical styles, including elements of afro-beat, salsa, rock & roll and electronica. Brian Jâ€™s classic songwriting and the bandâ€™s undeniable swagger on stage consistently energize dance parties wherever they appear. In 2011, The Pimps of Joytime released their second studio album, â€œJanxta Funk!â€ through the boutique label Wonderwheel Recordings.Â With a steadily increasing repertoire and a passionate following of music lovers nationwide, the time was right to fortify their organization.Â The wall of their Facebook page is constantly receiving enthusiastic posts from fans from around the globe as word of mouth further carries news of this fresh new arrival. The Pimps of Joytime are poised to bring their audacious sound to savvy audiences around the planet. Their forthcoming third studio album coming this fall will be a new chapter in the book of the Funk and a testament to the fact that real music is alive and kicking!